Sign Up for Classes Now! 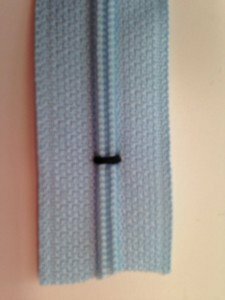 Stitch across the coil to shorten a zipper. Can’t find the length of zipper that you need for your project? Buy a longer zipper than what you need and shorten it. Measure the length you need and shorten it from the bottom, by stitching over the coil at the desired length. Cut off the excess leaving about an inch below the stitching. I usually just stitch it by hand but you could do a stationary zig zag on the sewing machine too. This will work beautifully on a standard zipper or an invisible zipper. Sign up for sewing tips & tricks delivered to your inbox!